At the end of 2017, we demonstrated that folio 116v was simply a text written in abbreviated Latin. In it, the author indicated that the Voynich manuscript was written using a dictionary of abbreviation in Latin. On the basis of this indication we analyzed the text of the manuscript and found that this track gave results. Quite simply, one could say: "The author of the manuscript employs a system of coding letters combined with a phonetic system. These two systems inherit the techniques conventionally used in the abbreviated writing of Latin." 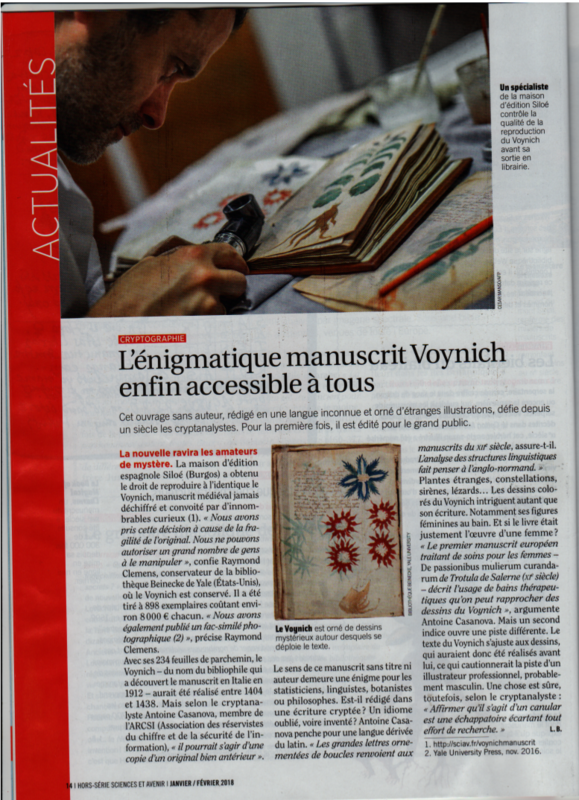 We have synthesized the results obtained in the article: "Voynich's manuscript - Reading an Elegant Enigma", published at the end of 2018 in the bulletin of ARCSI n°45 and which you will find below. We present in this article the linguistic rules, a first version of the coding table and the dictionary used... And of course, some decrypted sentences belonging to the folio f66r and f80r. The Voynich's manuscript language uses Latin abbreviations and its syntax is based upon syllogisms. It seems that the folio 116v was written in abbreviated Latin language. For example, the famous word "oladabas" would be in fact the assembly of "o la dabas" for "omnem | litteram | dabas" giving "all the literature you confided" and "michicon" a Latin form of "eucharisticon" for "thanking". I give you here the translation in english of the four lines belonging to this folio 116v. - Line 1: The title is a set of notes whose last remains unreadable, for the first, the author of the folio 116v quantifies its results: "I could read 730 syllogisms certainly but 74 of them remain difficult to understand"
- Line 2: General: "My thanks for the reading that you have given me. It contains many qualities that captivate in a subtle way. It is an ordinary subject indeed that can not be done by a dignitary attached to the person of the Pape." - Line 3: precision on the motivation: "It is a process invented to tend towards a perfection. Using mechanically a simple list of abbreviations"
- Line 4: mysterious formula: "All the Earth the whole Earth / Pray, immorality becomes strong and your success is to have made the story / to have renounced the Devil. Cultural marriages make harmonious mixtures" . These two translations are possible equitably: "to have made the story" and "to have renounced the Devil". 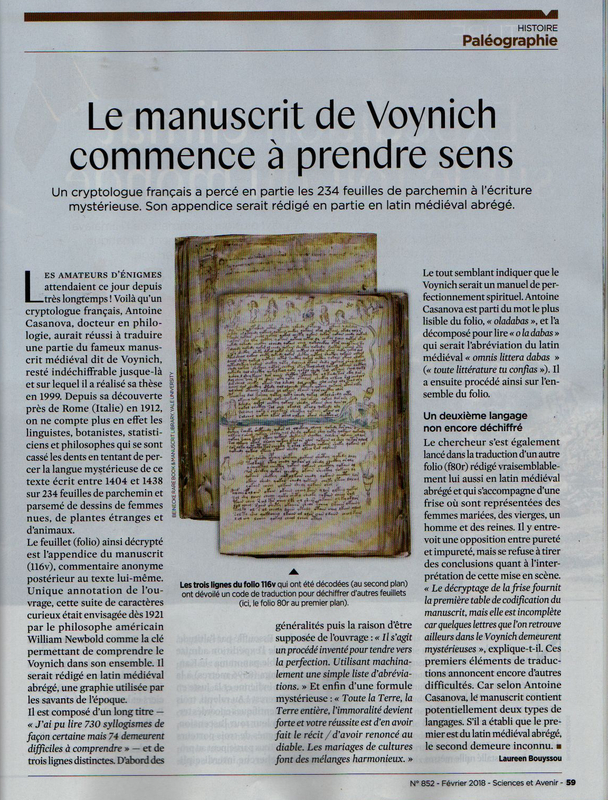 For those who know the French language, they can find hereunder the article "Les codes formels - Éléments de décryptage du manuscrit de Voynich (2017)". The second article deals with the informal aspects encountered in the manuscript (for example: the symbolism of colors) and can help to understand the cryptanalysis described in the article hereunder too "Les codes informels - Eléments de lecture du manuscrit de Voynich (2016)”. 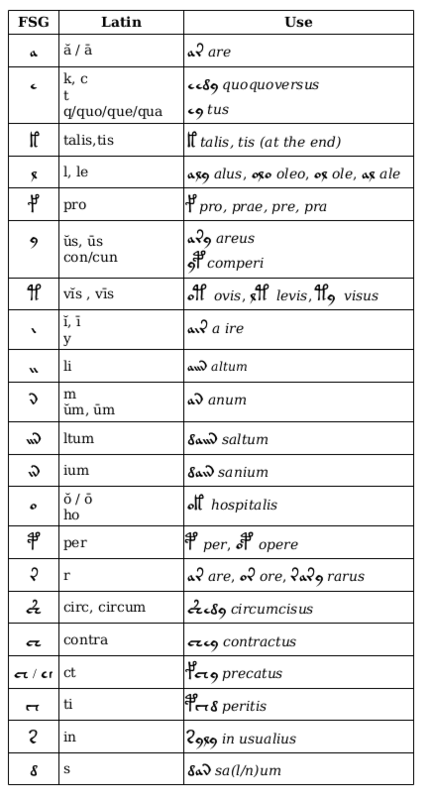 The author of the manuscript uses a system of letter coding conjugated to a phonetic system. These two systems inherit the techniques conventionally used in the abbreviated writing of the Latin. In an abbreviated Latin system, the phonetic behavior of letters may vary depending on the position of the letter into the word. 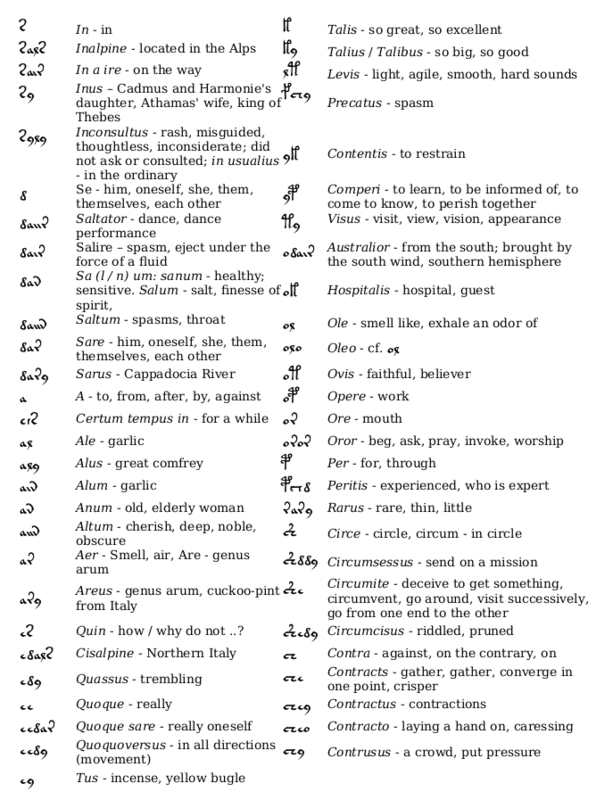 In an abbreviation system from “classical” Latin the same letter may have a different phoneme depending on its position into a word. Particularly, at the ending and at the beginning of a word. The Voynich manuscript has the same behavior. Note: read "alium" and not "altum"
The sentences of the manuscript have multiple structures. We find the simple sentence or "independent proposition" related to any other proposition, it can be a verbal sentence or a nominal sentence. Compound or even complex sentences are also present and can therefore contain independent, coordinated or juxtaposed propositions. The verbal propositions identified in the manuscript express the tenses of the present, of the perfect and of the imperative, to the passive and active forms. The assembling of words in blocks impacts directly the use of the Latin grammatical cases by omitting sometimes one of them. In abbreviated Latin, it is a common process, it uses distinctive signs placed in superscript to specify the grammatical case. In the Voynich's manuscript these indicators are absent. This absence implies that the words must sometimes be broken down by the reader and obliges the reader to exert a consistent effort to unambiguously translate the abbreviated text. The author uses his own dictionary of knowledge to select the words of the manuscript. This dictionary or lexicon is based on a grammatical simplification of the Latin. It could be the result of the linguistic movement from Latin to Proto-Italian and Romance languages, but could be more likely the use of an abbreviation system. The author translates the words of his lexicon, from the Latin to Voynich, according to the Zipf's law. He selects them preferably according to their frequency and their phonetic proximity. In the sense that the author focuses on the dominant phonemes of the word and then, by sorting, selects the shortest word with the "code + phonetic" characteristics. Thus, the author develops a minimal effort to code the most appropriate word. Although this method allows a fast writing, as is the brachygraphy, it shows limits in its reading. The reader does not necessarily share the same lexical culture, and because of this, the choice of the word obeying a structure "code + phonetics "may be competing with other words in the reader's lexicon. The ambiguity becomes all the more important that the reader will attempt to read the manuscript from a lexicon of “classical” Latin, sometimes too distant from the cultural and linguistic context of medieval Latin. The second consequence of such a system is that this system traps the author by inexorably leading to a use of the most easily accessible abbreviations, in his lexicon, and thus to create a redundancy in the use of the same words, not translating not the same thought, increasing polysemy and thus reducing the apparent diversity of vocabulary used. Surround! like yellow bugle on the way ... "
The bottom down of the folio f66r contains an elongated person and surrounded by two particularly interesting texts because apparently not belonging to the same language. What does the decryption of the sentence accompanying the elongated person in the folio f66r tell us? "I manage a sudden leap of the believer by fighting against appearances (symptoms) and to restrain contractions for a while. " It says that the author is in the narration of an event confronting him with a suffering person and whose meaning is related to the decryption of the first sentence of the same folio. The folio f66r contains another annotation located at the bottom left of the folio. This annotation is written with an alphabet other than that of Voynich. Having worked on and decoded folio f116v, the last written page of the manuscript, he has seen similarities between the morphology of the abbreviations of the folio f116v and those of the letters in this annotation. The consistency and color of the ink reinforce the idea that these two writings are the works of the same author. This observation tends to prove that this annotation is posterior to the Voynichs manuscript and contemporary to the folio f116v. The annotation in question is arranged in a cross. At the top of this cross, we find the letter "y" used in the Latin abbreviated system of the 15th century to mean “vide” or “versus”. The other words on this cross contain letters from the folio f116v. What are they ? The word "Rel" abbreviates the Latin word “relicta” or “relegit”. The word "mvB" constituting the abbreviation and whose developed form is “misce vestra beatitudo”. And the word "Ren" to abbreviate “Renuntiando”. The decryption of the folio f80r frieze shows that the author stages and gives the floor to the characters. This work shows that the Voynich's manuscript was understandable in its time, the author told us in his notes left at the conclusion of the manuscript, in the folio 116v. We have discovered that this same author has written in other places in the manuscript, especially in folio f66r. He also told us that we were in the presence of an asceticism practice, allowing progress in the spiritual field. We can say for certain that this practice was also associated with the medical and the herbalism fields. We learn that the author of the manuscript means to have been, in contact with "guests" from northern Italy, in an area endemic to yellow bugle. Thus, we could almost deduce that it was in the Mediterranean region at an altitude between that of the sea and that of the middle mountain, and by exclusion, in a region other than that of northern Italy. As for the process, it does not currently reveal any use of Lullian language or syllogisms. However, some letters remain encrypted and could be the source of a demonstrative logical expression that remains to be demonstrated. At this stage of his analysis we can confirm that the author of the Voynich wrote, in Latin, using a list of Latin abbreviations combined with the use of a list of phonemes. The consequence of this method being that, at first analysis, the text appeared to us consonantal. En Français : Le manuscrit de Voynich - Lecture d'une élégante énigme, bulletin n°45 de l’ARCSI, 2018. In English : The Voynich’s manuscript - Reading an elegant enigma, translated from the bulletin n°45 de l’ARCSI, 2018. Les codes formels - Éléments de décryptage du manuscrit de Voynich, bulletin n°44 de l’ARCSI, 2017.
et dans le Science & Avenir de Février 2018 "Le manuscrit de Voynich commence à prendre sens"
Les codes informels - Eléments de lecture du manuscrit de Voynich”, bulletin de l’ARCSI, 2016. 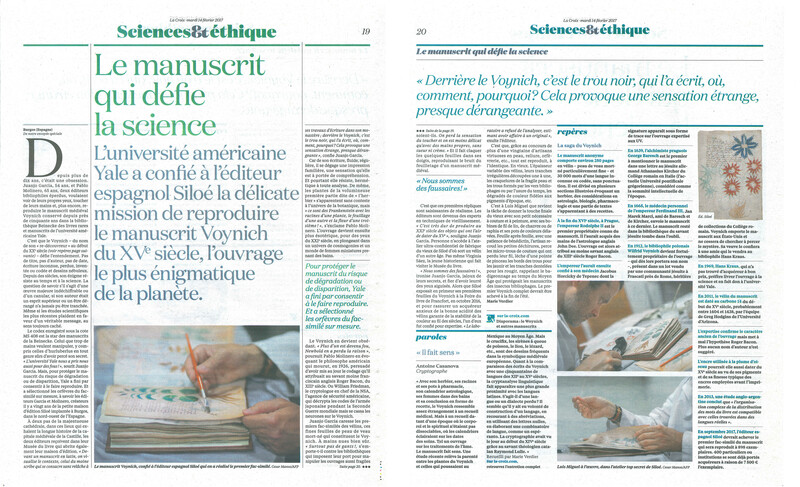 Hors-Série Science & Avenir Janvier-Février 2018. Journal La Croix du 14/02/2017. Fac-similé du manuscrit de Voynich - Paroles "Il fait sens"
France Culture, La Méthode scientifique. NATO, Combining Security Assurance and High Performance in Hostile Environments – SHIVA (Secure Hardware Immune Versatile Architecture), INFORMATION ASSURANCE AND CYBER DEFENSE, 26 – 27 April 2010, Antalya, Turkey 2010. Quotation- G. Rugg, The Voynich manuscript : anelegant hoax ? in Cryptologia, vol. 28, n °1, janvier 2004. Le manuscrit de Voynich”, Les dossiers secrets de l’histoire, 2005. Les dernières cryptanalyses du manuscrit de Voynich” bulletin de l’ARCSI, 2000. Le manuscript de Voynich”, Colloque ARCSI, 2000. Hypothèse de la langue slave dans le manuscrit de Voynich”, bulletin de l’ARCSI, 2002. Structures linguistiques dans le manuscrit de Voynich”, Péronne, 2001. Invention Générateur Automatique de Document d’ Expertise Critères Communs, CNSIF, 2000. Invention “Génération Automatique de permutations ordonnées en temps réel”, 1997. Article “ L’ aventure des codes secrets” , SCIENCE & AVENIR, 1995. Cryptographic module Common Criteria conformance : Results of the SHIVA FUI project, Marie-Laure Potet, Antoine Casanova, 2012. Ph. D Antoine Casanova – Strategy and ICT development coordinator. He arises from a university doctoral formation in mathematical, linguistic and artificial intelligence. 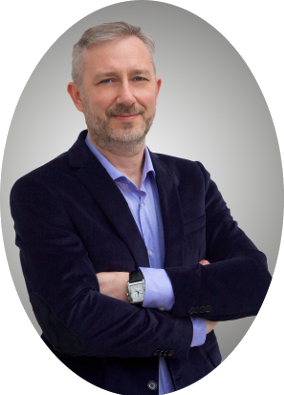 He is the author of articles and a speaker on the cryptography and the cryptanalysis. He is a world reference in the cryptanalysis of the Voynich manuscript. As expert of the Information Security, he implemented the security of systems for the Ministry of Defence, the European Community and for NATO.